We continue to see motherboards with radial electrolytic capacitors in various stages of failure, starting with bulging and proceeding to cracking and leaking. Once they begin to bulge, they continue to expand until they crack and leak. This eventually leads to lockups, delays, restarts, error messages and eventually power-on failure. This is a slow failure process that proceeds over months. Electroytic capacitors fail as the chemical gel inside begins to break down, producing gas bubbles that break the capacitor and allow the gel to leak out. Possible causes for the gel breakdown include a contaminated chemical gel formula, overheating and age. No conclusive determination as to the cause of capacitor failure has been proven. Most of the capacitors that we see failing now are in Dell computers made between 2003-2005, but the problem is widespread with many other manufacturers having capacitor problems, including HP and Intel. 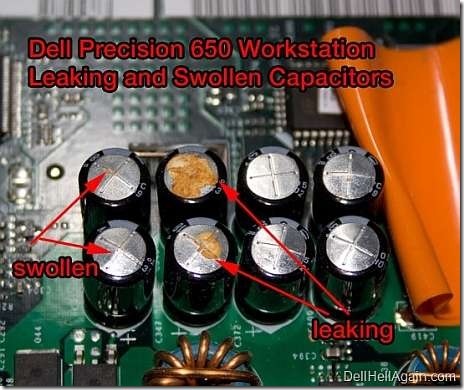 There are extensive reports and even a lawsuit with Dell over the use of capacitors that began failing as soon as one year after usage. However, Dell has been reticent about capacitor failure and did not offer to replace or repair systems with failed capacitors. Intel also sold thousands of motherboards that developed capacitor failure, but they dismissed the problem describing the capacitors as unrelated to reliability or performance. While failed capacitors can be diagnosed visually through inspection, it is not practical to test capacitors while attached to a motherboard, since the capacitor cannot be electrically isolated. Our practice has been to visually inspect every motherboard and recommend replacement motherboards or systems when one capacitor is found to be bulging. We also offer a capacitor replacement service for high value desktop motherboards. For more information on this topic, visit BadCaps.net, a forum with extensive information on capacitor failure problems. This entry was posted in Computers and tagged black screen, blue screen, BSOD, capacitor, Dell Computers, failure, hp, lockup, motherboard, restart. Bookmark the permalink.